Popes in popemobiles create, as they always do, a sort of undulating ecstasy in the faithful who have traveled to see them. It was no different for Pope Francis as his heavily guarded Jeep Wrangler made a brief trip around the Ellipse under a sun-dappled sky Sept. 23. 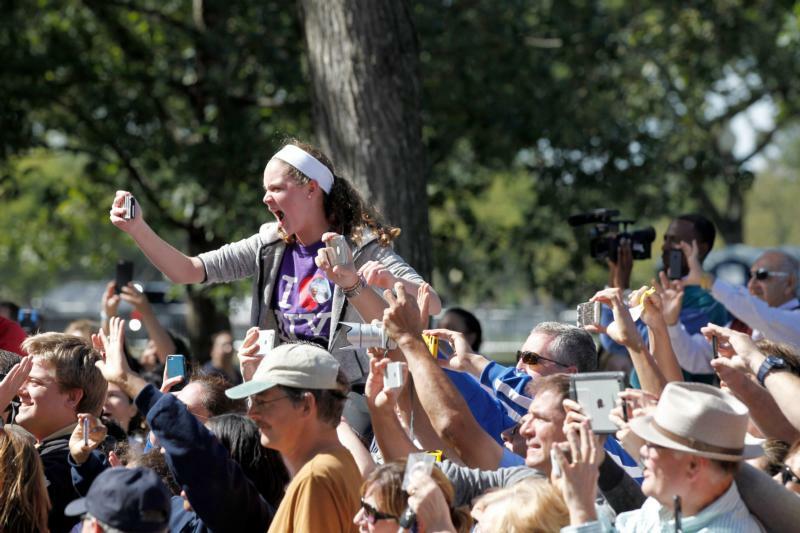 There were shouts, waves and a solid forest of arms holding cellphones high along two blocks of Constitution Avenue as thousands sought to get the pope to look in their direction. “Amazing! He gave us a blessing!” said Honduran-born Matilde Alvarado of Falls Church, Virginia. Francis was the third pope she’d seen in person. The high security — uniformed officers from several agencies, bomb-sniffing dogs, Homeland Security and FBI agents, fire trucks and ambulances — bothered her a bit, though. Sophia Cruz, a persistent 5-year-old on Constitution Avenue, was allowed to present the pope something after he gestured in her direction. She gave him a handwritten letter, for which she earned a hug. Pope Francis also kissed an infant boy handed to him by plainclothes officers. Spectators began arriving at 4 a.m. (EDT) when gates to the secured area opened. Most, though, arrived by mid-morning and had only a few hours to wait before the “parade” rolled by shortly after 11 a.m.
What to do during the hours of expectation? Some brought card games. Many women prayed the rosary. Others swapped stories of other popes they’d seen and chatted with police. The protesters were shortly on their way down the sidewalk. “You’re like evil spirits!” one woman shouted as they departed. Chilean-born Mariajose Ovalle of Alexandria, Virginia, who was there with her 6-year-old son, Matias, said seeing popes in person was a vital emotional part of living her faith. She saw Pope Benedict XVI in London, but her most memorable sight was St. John Paul II at his last World Youth Day, in Toronto in July 2002. Alvarado, Ovalle and Alvarado’s friends Andrea and John Finch, rather than risk the uncertainties of a very crowded Metrorail subway train, took a water taxi up the Potomac from Alexandria, arriving shortly after 8 a.m.
Andrea, from Peru, was seeing her first pope in person. John, as a child, had seen Pope Paul VI at a Vatican audience.